Entangled Islands by Serie Barford was launched at Poetry Live, The Thirsty Dog, K Rd, Auckland City, on Tuesday 1st December. Over 100 people attended the launch, and a fun time was had by all! Entangled Islands is now available for sale on this website under the Books tab and in all good independent book stores nationwide. 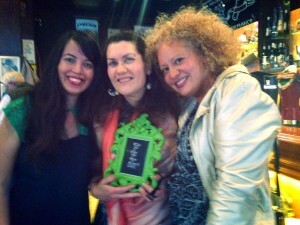 Anahera Press Publisher Kiri Piahana-Wong with author Serie Barford and Launcher Karlo Mila.